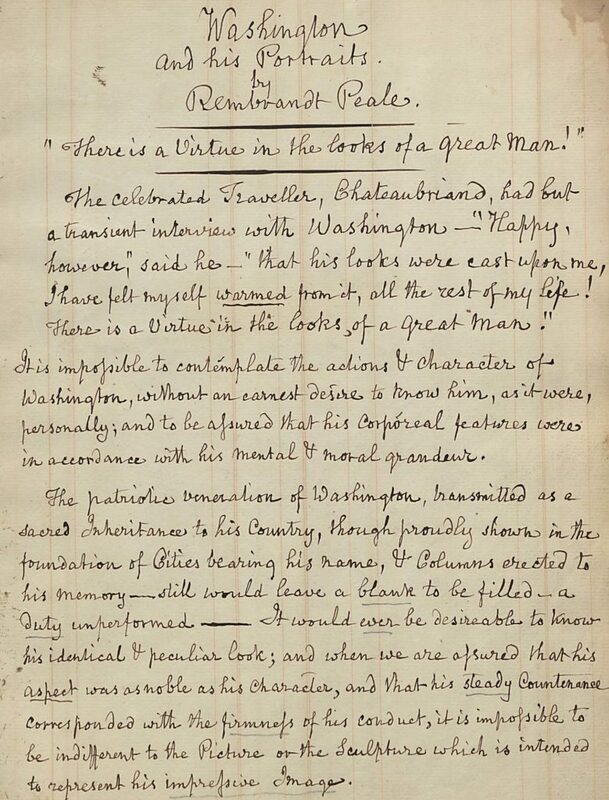 First page of Rembrandt Peale’s “Washington and his Portraits” lecture. Collection 396, Downs Collection, Winterthur Library. 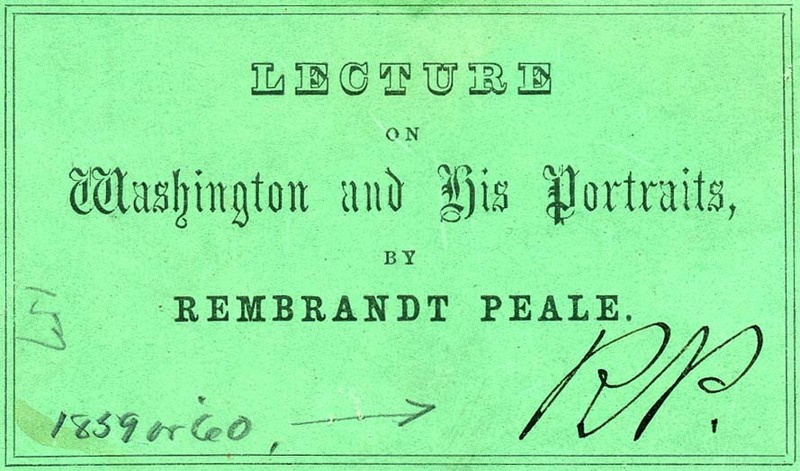 Ticket to Peale’s lecture. Collection 66, Downs Collection, Winterthur Library. 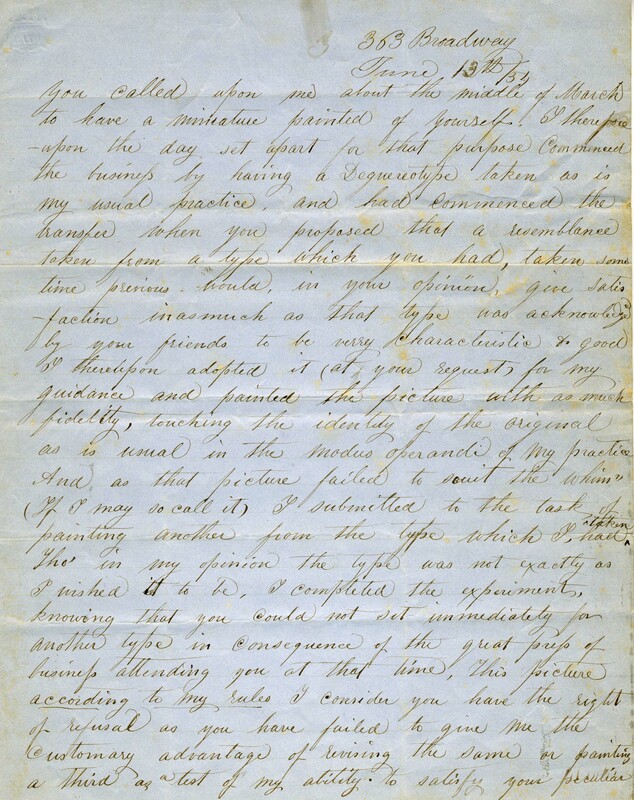 Early in his talk, Peale provided a description of Washington: “six feet one inch in height – in his boots, six feet two – His weight about two hundred & twenty pounds – his complexion was florid – Eyes of the deepest blue – and hair a dark brown.” Yet more importantly, he was interested in whether the subject’s personality and character shone through in the portraits. Using his copies of a number of paintings, Peale offered his opinions on their successes and failures. Did he believe that any artist captured the full essence of George Washington during the many stages of his life—soldier, statesman, president? George Washington sat for his first portrait in 1772 for Rembrandt’s father, Charles Willson Peale, the only painter he used for nearly 20 years. 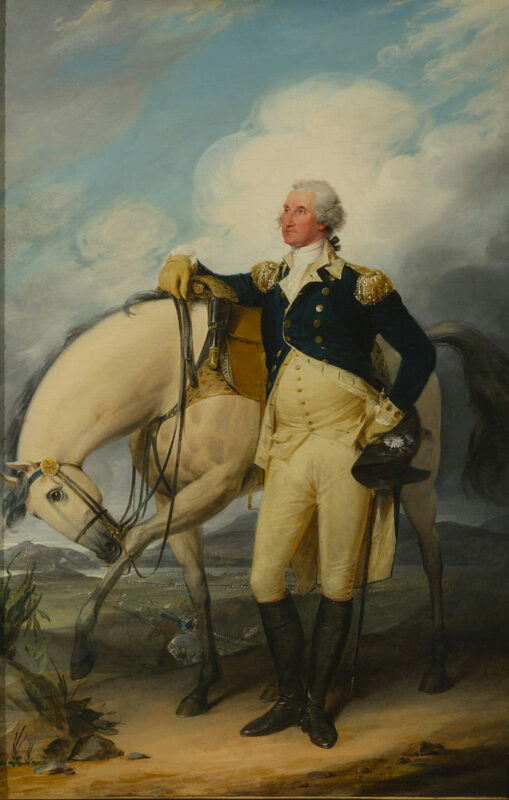 Seven years later, the elder Peale painted the first full-length portrait of Washington, which depicted the 1777 victory against the British at Princeton, as a commission for the Pennsylvania State House. The artist, capitalizing on the hero’s popularity even abroad, sent one of his many copies to Benjamin West in London who handed it over to others to be engraved for sale on the lucrative secondary market. 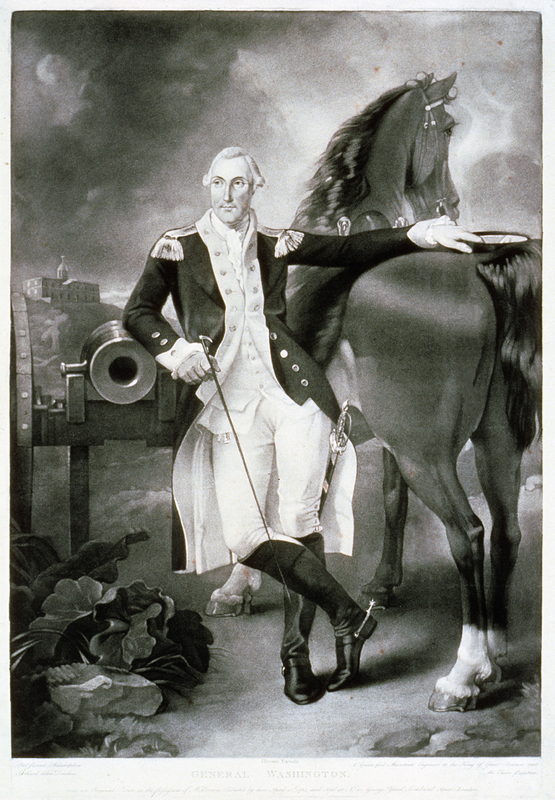 The resulting print, readily available to more households than any painting, shows many modifications in Washington’s face, figure, and positioning. Commenting on these two paintings by his father, Rembrandt Peale noted that they “represent him with short neck & broad, sloping shoulders” and “sometimes wanting energy of expression, with noses & eyes defectively small, ” but still depicted a “majestic” figure. By 1790 Charles Willson Peale’s monopoly ended as the growing demand for images of the newly elected first president of the nation created opportunities for many more artists. One new artist, John Trumbull, had served as Washington’s aide-de-camp in the early years of the Revolution. With his first-hand knowledge of his subject as a soldier, Trumbull chose to commemorate the 1782 review of the French troops at Verplanck’s Point in New York and later adapted this into a full-length copy for New York City Hall. Trumbull again modified this painting two years later, maintaining Washington’s “heroic military character” in an earlier moment at Trenton after crossing the Delaware River in 1776. Instead of responding to Trumbull’s intended noble representation of Washington, Peale found the latter work exuded a “graceful elegance” but wanting “the peculiar dignity of Washington” and stated that although the artist preferred this one, he found the earlier work a better likeness. 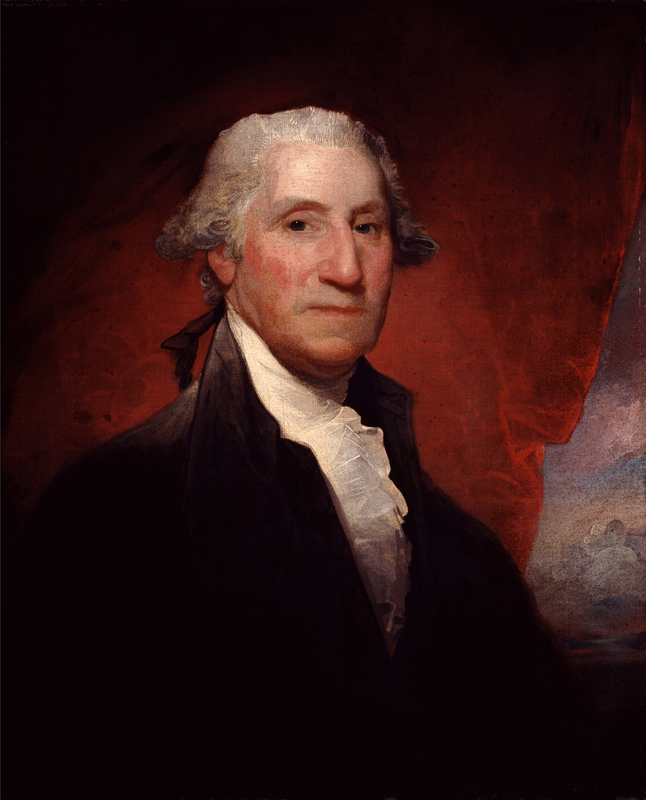 In his recollection of the autumn of 1795, Rembrandt Peale described both he and Gilbert Stuart simultaneously painting Washington for their first time, with Washington unable to return the following day for a second sitting with him as he had already promised to sit for Stuart that day. While this portrait was Peale’s only one done from life, Stuart was granted sittings for more portraits soon after. Peale correctly noted that Stuart’s second portrait became the standard one, later reproduced on America’s one-dollar bill. Stuart found his sitter “difficult to engage in conversation,” unaware of the cause until later—a new set of teeth that made speaking painful. Stuart was dissatisfied with his first portrait, whereas Peale considered it better in the lower portion of the face than the second one for the same reason. How successful were artists in capturing Washington? According to Rembrandt Peale, Washington’s “family & Friends lamented that they possessed no Portrait of him which they considered entirely satisfactory.” Peale agreed, although admitted that each “possessed some peculiar merit.” He himself struggled to create a worthy portrait, but was finally convinced he had achieved success with his 17th painting of Washington, Patriæ Pater (1823–24), now owned by the U.S. Senate. Despite various deficiencies, interpretations, and distortions evident in all the arts works portraying George Washington, the works themselves and the sheer number and ubiquity of them have forever embedded George Washington in our minds as the Father of our Country. Howard, Hugh. 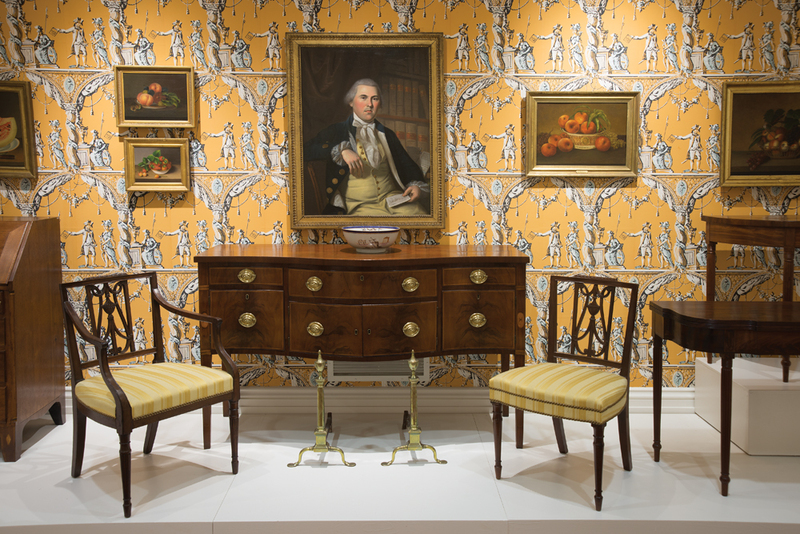 The Painter’s Chair: George Washington and the Making of American Art. New York: Bloomsbury Press. 2009. Staiti, Paul. Of Arms and Artists: The American Revolution through Painters’ Eyes. New York: Bloomsbury Press. 2016. ¹Variants of this lecture exist in other repositories. 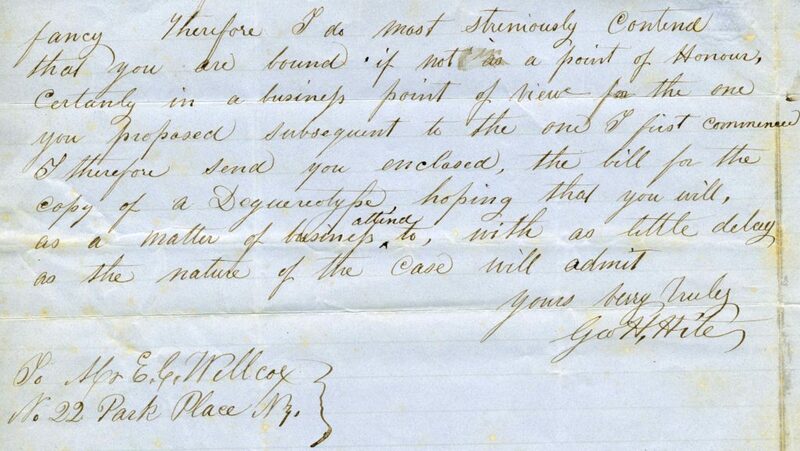 The copy in Winterthur Library’s Peale Family Papers (Collection 396) is the basis for quotes and information in this post. Dining by Design: Nature Displayed on the Dinner Table, opening April 1, 2018, takes a fresh look at the history of dining and dinnerware from the 1600s through modern times and celebrates how hosts and hostesses have brought the natural world into their dining rooms over the centuries. 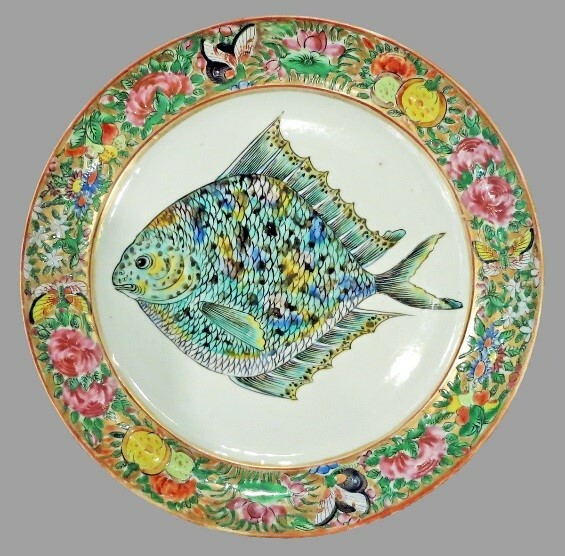 Everything from painted butterflies and hand-modeled flowers to tureens in the shapes of the foods served in them will be on view, set among a fascinating range of ceramic and silver tableware. 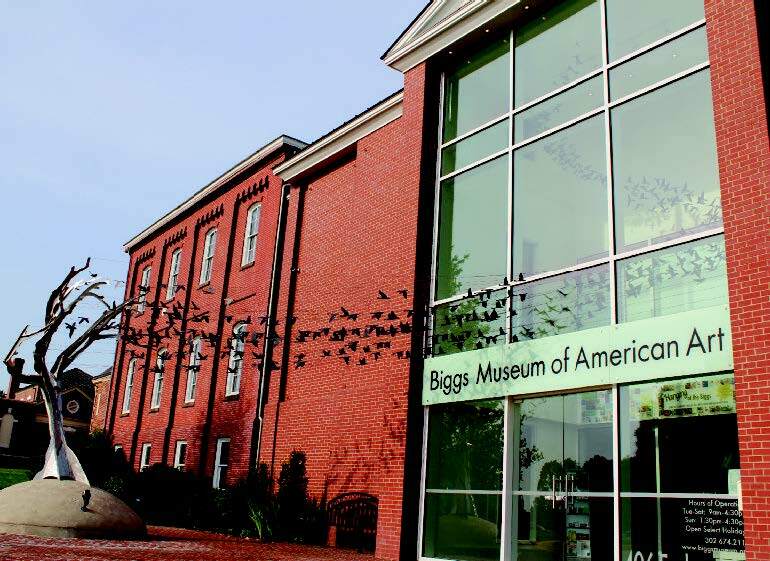 The show will feature more than 500 objects, requiring more than 50 staff members and contractors to be involved in the project! Setting up an exhibition is more complicated than you might realize. Take, for instance what’s involved in creating a single display for this show, such as the 1700s table plan, which will be displayed hanging on a wall. Consider the fact that for centuries, elegant dinner tables have been laid out in formal, bilaterally symmetrical (mirror-image) arrangements. 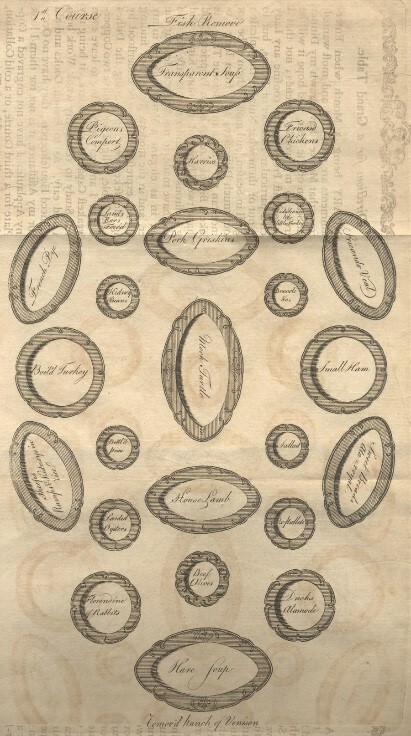 Many early cookbooks not only provided recipes but also included table plans illustrating how to lay out the dishes. After reviewing many such plans, I settled on one showing a first course for a banquet from Elizabeth Raffald’s 1769 book The Experienced English Housekeeper. Although Winterthur includes the book in its library, Kansas State University has one in better condition and is letting us borrow an image. 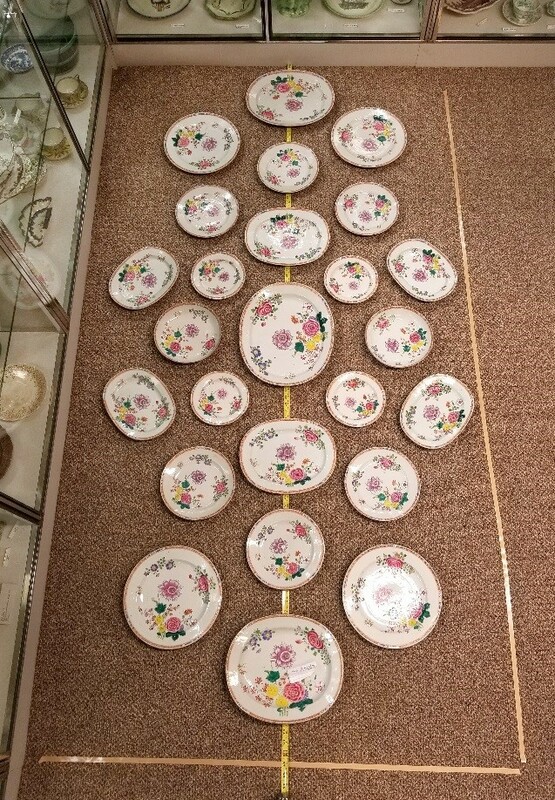 Besides being an excellent example of such table plans, this one has the right dish shapes to match Winterthur’s assembled Chinese export porcelain dinner service in the German or Saxonian floral pattern. 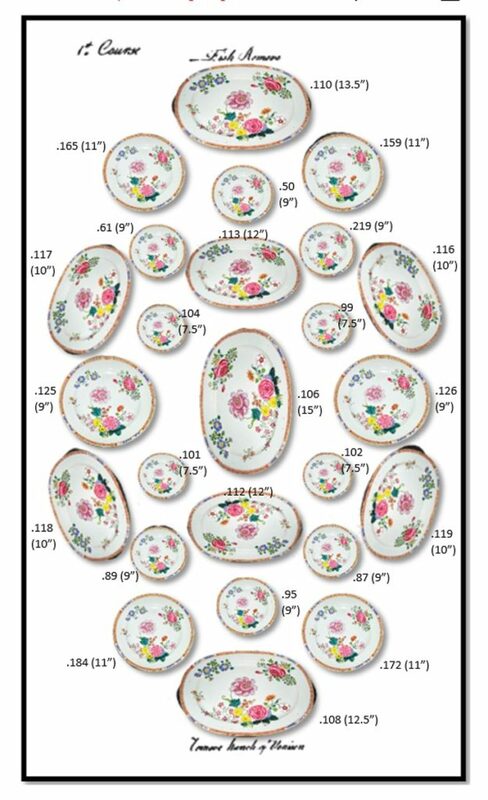 Twenty-five plates and dishes were needed to reproduce the table plan. Fortunately, the service includes more than 250 objects. Unfortunately, they are dispersed throughout display and storage areas in the nine-floor museum building. 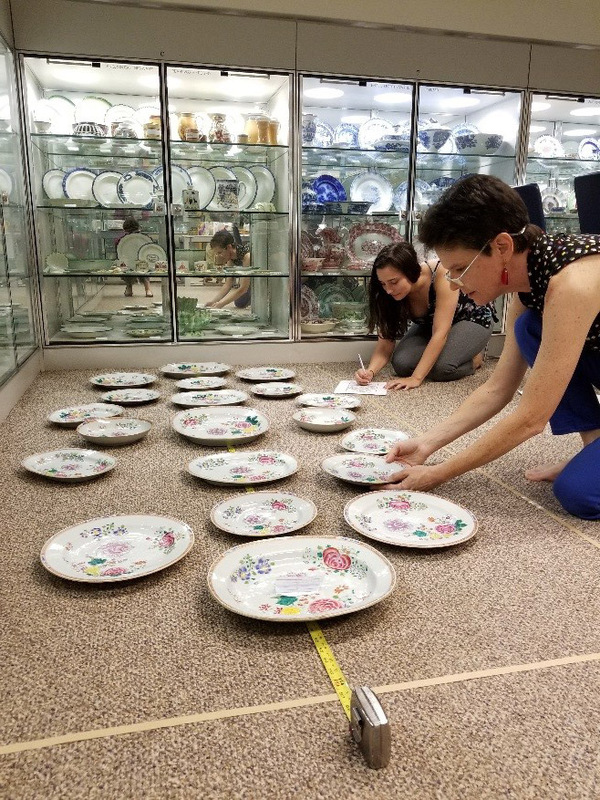 So joined and assisted by graduate student Becca Duffy from the University of Delaware/Winterthur Program in American Material Culture, I headed off on a quest. 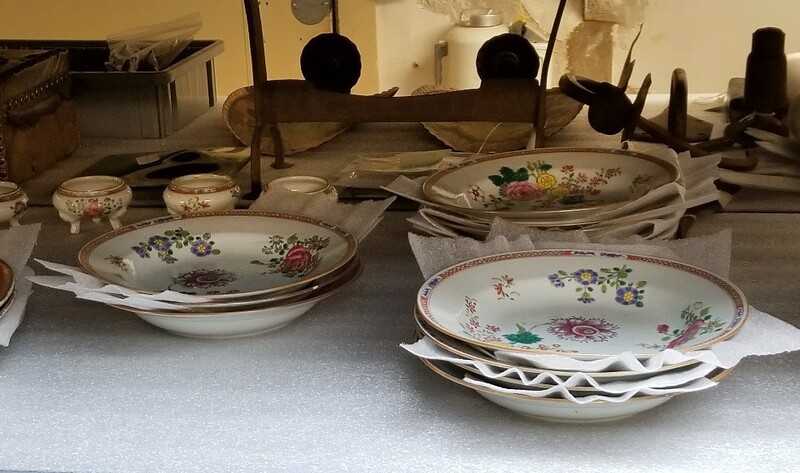 In addition to narrowing down the choices to objects that were of the right proportions and were not in need of conservation, we looked closely at the colors painted on each plate and dish. 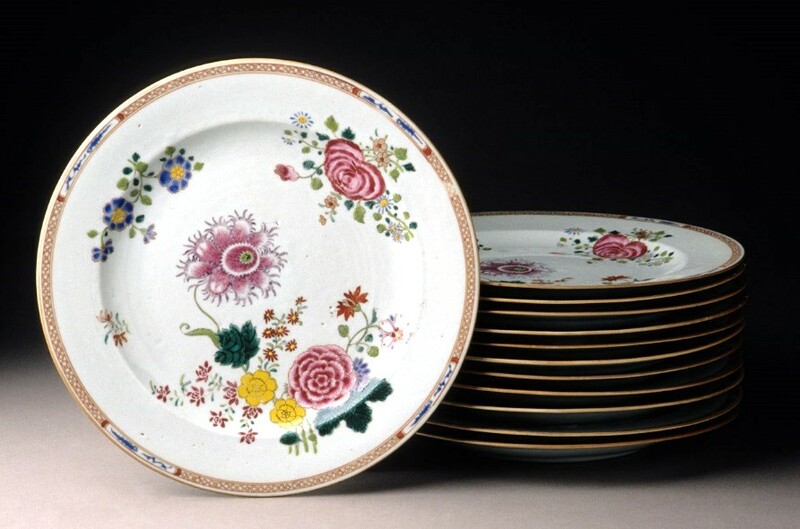 As is true of other patterns, German or Saxonian floral designs were popular and were created over many years. During a period when colors were mixed by the batch, shades might differ dramatically on dinnerware produced at different times. The full Winterthur service for example, has some shades of purple that are quite pink, while others have bluer tones. For the display, we wanted to select pieces with closely matching colors. 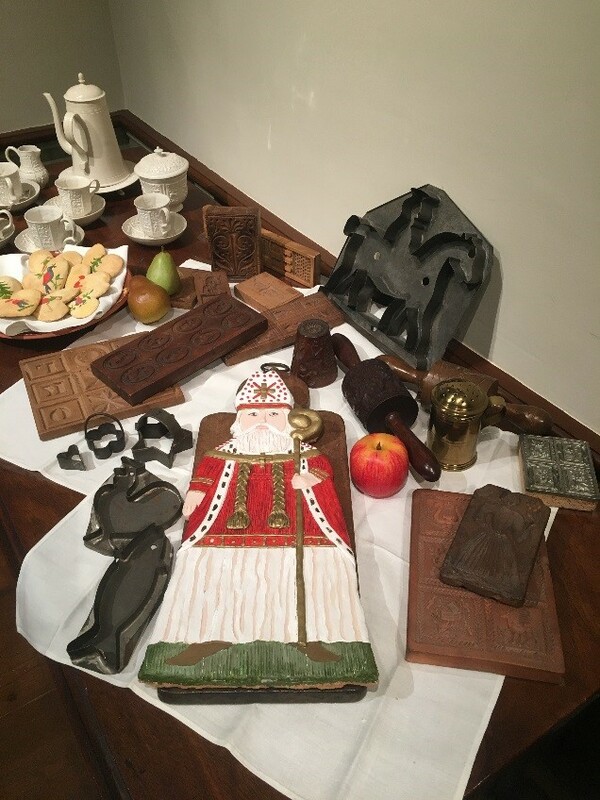 Once a likely group of about 50 objects was selected, we gathered them together in the Ceramics and Glass Study so we could narrow the choices down to 25 objects. A space approximating the size of a mid-1700s dinner table was taped off on the floor, and we began laying out the pattern. After the arrangement was finally completed, it was photographed. Then the accession (collection) number was listed, and measurements were taken for each object. 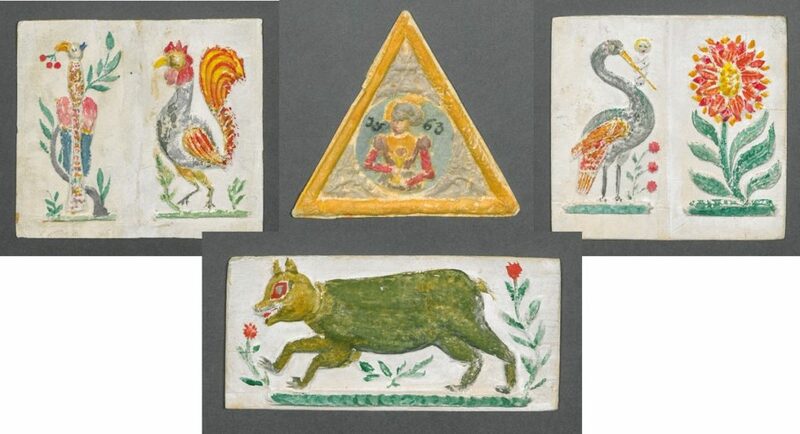 These were reproduced on a sketch that showed the placement of each plate and dish. The sketch was then shared with the exhibition designer, Doug MacDonald, so that he could complete the measured elevation view that will be so important when exhibition installation begins in March. Hats off to Doug, who had an even greater involvement in the placement of all of the other hundreds of objects in the show! And is all the work for this one display done, yet? No way! 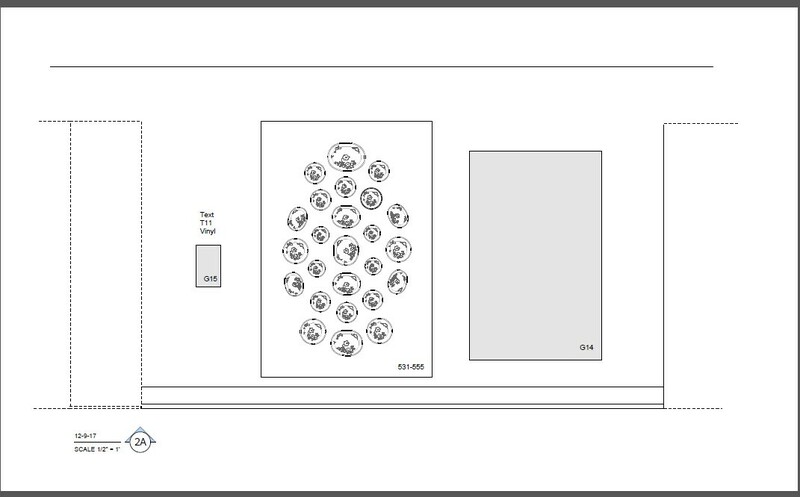 Special mounts will be made for each plate and dish, and it all will be installed on a purpose-built backdrop, approximating the size of an early dinner table. But that’s a story for another day. Be sure to join us for Dining by Design: Nature Displayed on the Dinner Table at Winterthur, April 1, 2018, through January 6, 2019! This is the first in a series of posts about the making of the Dining by Design exhibition. Early in his career, painter John Lewis Krimmel sketched a scene of two men demanding payment from a distraught artist seated at his easel, wife and children helplessly witnessing his shame. Krimmel may have been practicing his compositional skills in this drawing for the well-populated genre scenes he later excelled in, but the subject matter remains intriguing. To what extent did this young artist worry about his future? Krimmel arrived in Philadelphia from Ebingen, Germany, by way of England around 1809, joining his older brother George who emigrated two years earlier. Mostlyself-taught, he most likely had some prior watercolor instruction while working in England before enrolling in classes and exhibiting at the Pennsylvania Academy of the Fine Arts (PAFA) in the early 1810s. Philadelphia in the early republic was a budding artistic center, and here he rubbed shoulders with fellow painters Thomas Sully and Rembrandt Peale. Throughout the decade, he stayed busy painting landscapes and people of different ages, classes, and races, and exhibiting at PAFA. His career seemed to be gaining traction with his election as president of the Association of American Artists in 1821. Tragically, only several months later, Krimmel drowned in a mill pond in Germantown, Pennsylvania, at age 35. 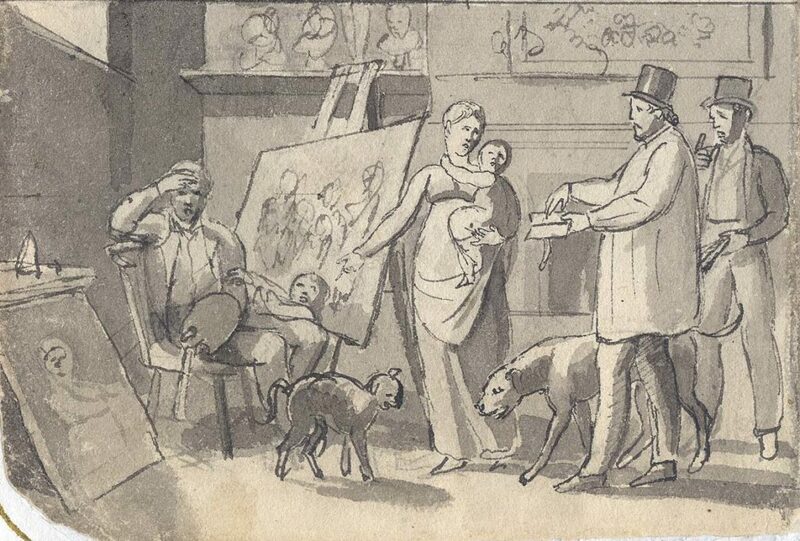 This sketch of a poor artist was never rendered in oil on canvas, but was somewhat prophetic as the 18 paintings listed in Krimmel’s probate inventory were sold to pay off his debts. Krimmel had every right to worry as factors beyond an artist’s control made painterly pursuits an unstable career choice. Artists depended on physical attributes—mobility, steadiness of hand, acuity of vision—that could easily be damaged and definitely diminished over time. Additionally, changing tastes and fickle patrons could easily cause painters to fall out of favor. More successful painters possessed a good business sense and savviness to help them manage expenses, navigate distribution networks, and attract and retain wealthy patrons. 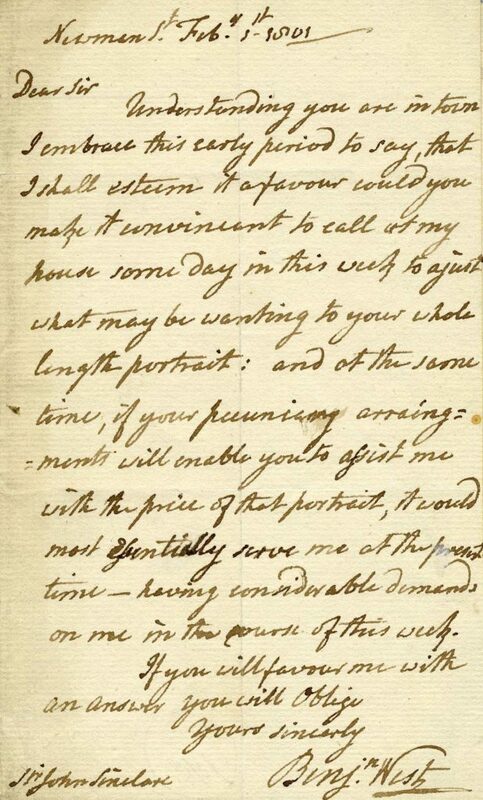 Even a noted painter like Benjamin West encountered patrons who were lax about payment. West himself enjoyed a long and successful career in London beginning in 1763 with accolades and patronage coming easily. He was appointed historical painter to King George III in 1772 and later served as president of the Royal Academy. Enormously influential, he trained numerous artists in his studio. However, while working on a portrait of Sir John Sinclair, West wrote under the guise of the need for another sitting “to assist…with the price of that portrait” as he had “considerable demands…in the course of this week.” Sinclair of Ulbster, First Baronet, was a Scottish politician, financier, economist, and author of several books who perhaps simply overlooked a promised payment to West amidst his busy schedule. West knew to tread carefully so as not to be left with an unpaid canvas by offending his notable client who could easily disparage him to potential clients. The letter apparently worked and accounts settled as Sinclair’s portrait was finished. It currently hangs in Wick Town Hall in Scotland. The trail stops there and whether a compromise was reached remains a mystery. A search through New York City directories offers additional information on the client. 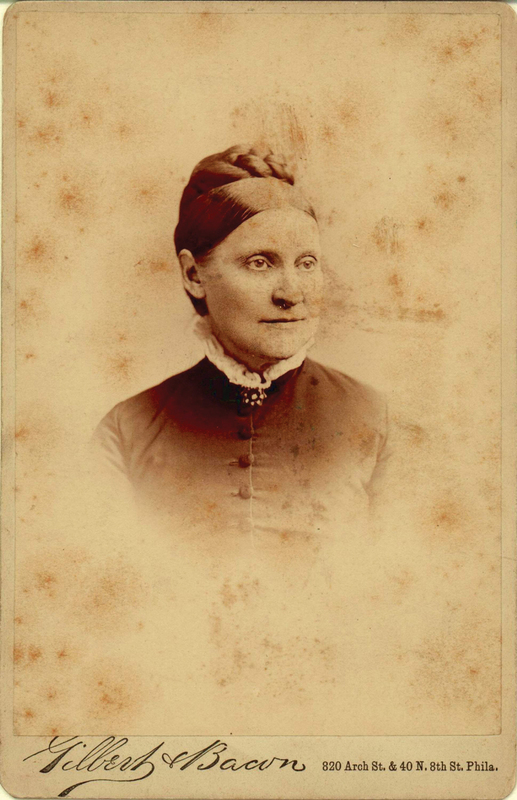 Wilcox was a dry goods merchant who moved his home and business several times in the 1850s. His store, located either on or just off Broadway throughout the decade, moved steadily northward, reflecting the quick settlement uptown of the time. Wilcox must have been keeping apace with that trend to capitalize on business opportunities. As he was becoming more successful or aspiring to greater heights, having his portrait painted, even in miniature, symbolized his growing status. An astute businessman could easily detect quality—was Wilcox sincerely unhappy with Hite’s work or was he merely reluctant to pay? Now immortalized through their paintings, artists’ personal lives and struggles are often overlooked. Their sketches and letters help to remind us of those details and bring them to life, adding dimensions to the artworks beyond a surface appreciation for them. 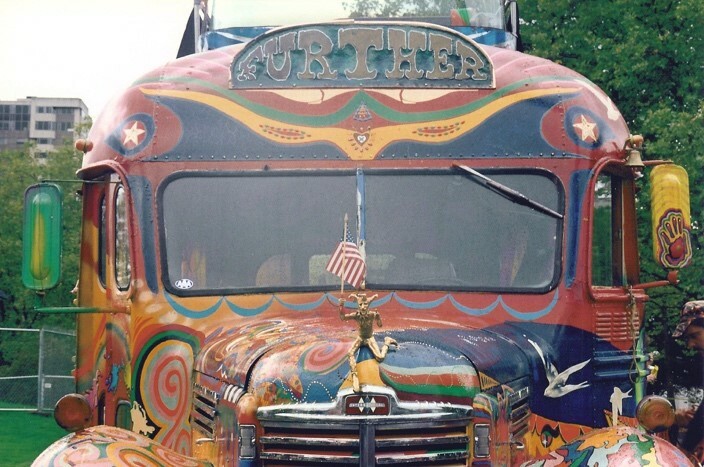 Ken Kesey’s DayGlo painted bus, a functional object that has come to symbolize the counterculture of the 1960s. Although the students in our group traveled in minivans, the spirit of camaraderie flowed on our own traveling caravan. 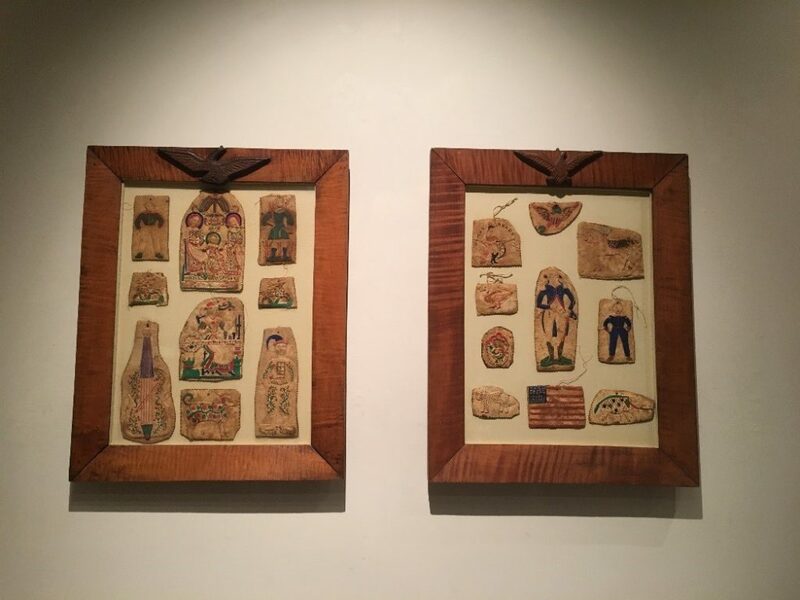 This semester, nine students from Winterthur and the University of Delaware Program in American Material Culture literally and figuratively “got on the bus” when they enrolled in my class, Cities on a Hill: Material Culture in America’s Communal Utopias. Although the hippies of the 1960s often come to mind when communes, utopias, and intentional communities are mentioned, the impulse to fashion a new way of living in opposition to mainstream society that involves social cohesion, relative isolation, and at least some communal sharing of ideology, property, space, and material goods, dates to the first European settlers on the shores of North America. 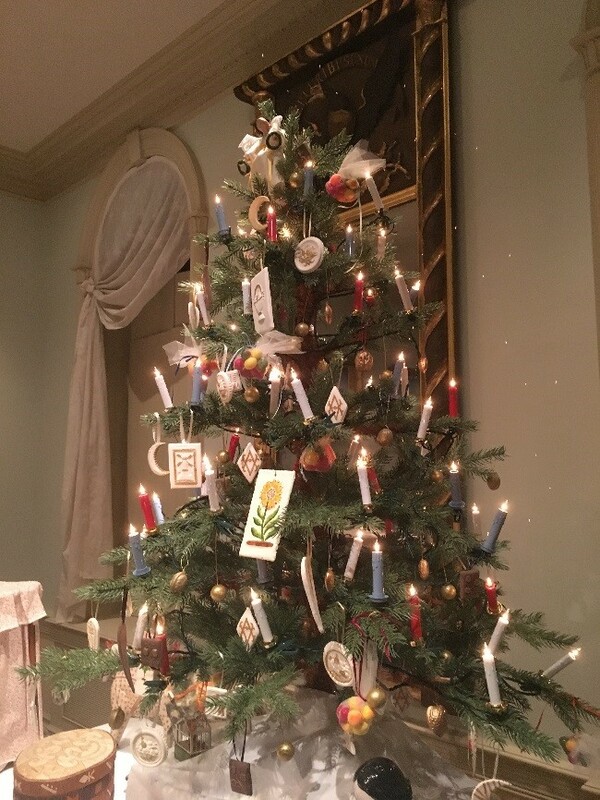 Throughout the course, we dove headlong into the history of American communal utopias using the Winterthur collection and field studies to come to a greater understanding of the diverse and unbroken tradition of communal living in America. Students were asked to seriously consider the concept of communal living and utopia by coming to terms with the humanity, practicality, and materiality of communal living, and their attempts to make a better world. 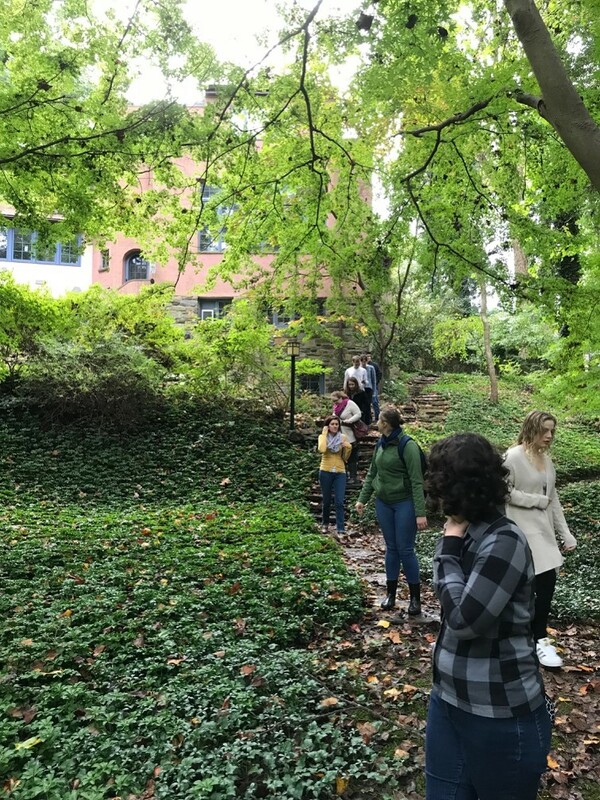 Students explored the internal network of rustic paths that cut through the dense woods to connect homes and recreation centers in Rose Valley, Pennsylvania—an intentional community inspired by William Morris’s utopian novel News from Nowhere. 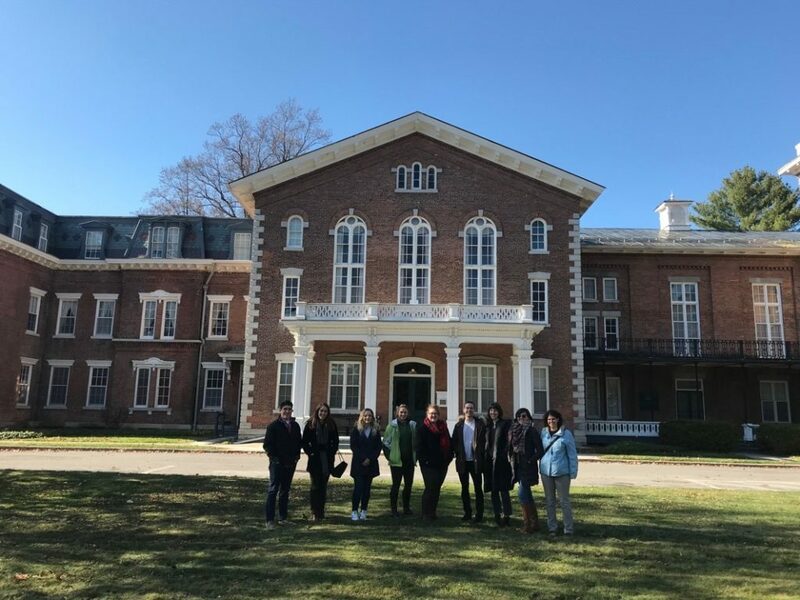 However, students literally hopped on the bus when we took a weekend field trip to upstate New York, home of the famed Burned-Over District of the 19th century that still smolders with the embers of reform. Field-based learning is a hallmark of courses based at Winterthur. They help students visualize, experience, and, in this case, live like the individuals who had, until then, only been known in books and photographs. The trip began at Byrdcliffe, an art colony outside Woodstock, New York, inspired by the English arts and crafts movement. 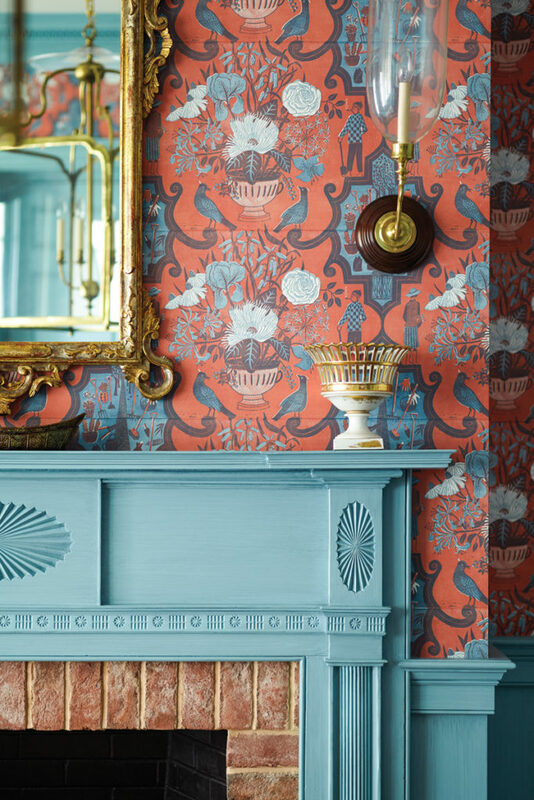 Here, renowned artisans and craftspeople came together to create furniture, ceramics, textiles, and fine art in the bucolic setting of the Hudson Valley. 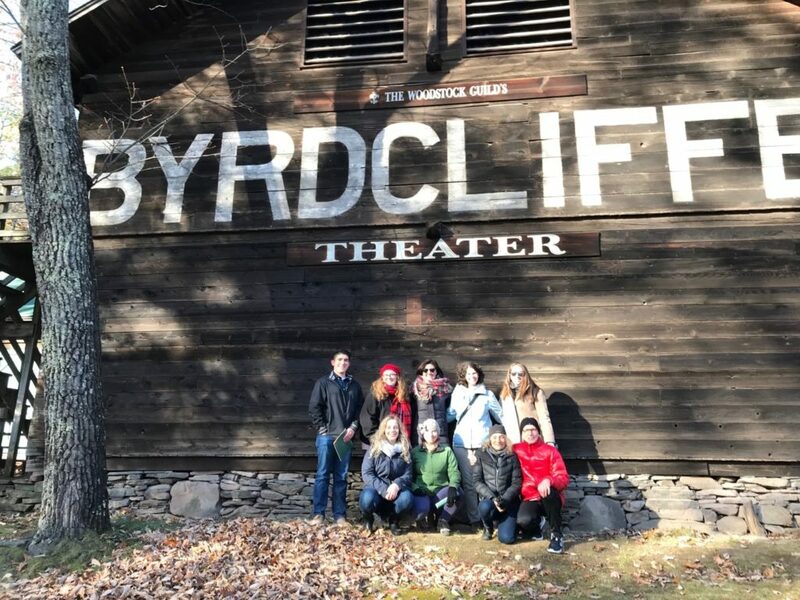 Though Winterthur holds the entire Byrdcliffe archive, traipsing the mountainous terrain of Byrdcliffe brought those documents and artifacts to life for the students. We were led by Director of Exhibitions Derin Tanyol and board member Henry Ford through some of the most stunning architecture of the American arts and crafts movement, including the founder of the community Ralph Radcliffe Whitehead’s own magnificent manor house, White Pines, and other buildings that are still used for artist-in-residency programs at the community. Indeed, although Woodstock is usually associated with the hippies of the music festival that bears its name, it was Whitehead who brought the avant-garde to the area more than 60 years prior. From there we headed to central New York and the fascinating Communal Societies Collection at Hamilton College. The delightful Christian Goodwillie, director and curator of special collections, came in on a Saturday night to show us their collection of the material culture of community—including ephemera from the House of David, comics from the Kerista Community, and amazing material from the Amana Community. In total, Goodwillie pulled more than 75 items for us to examine. 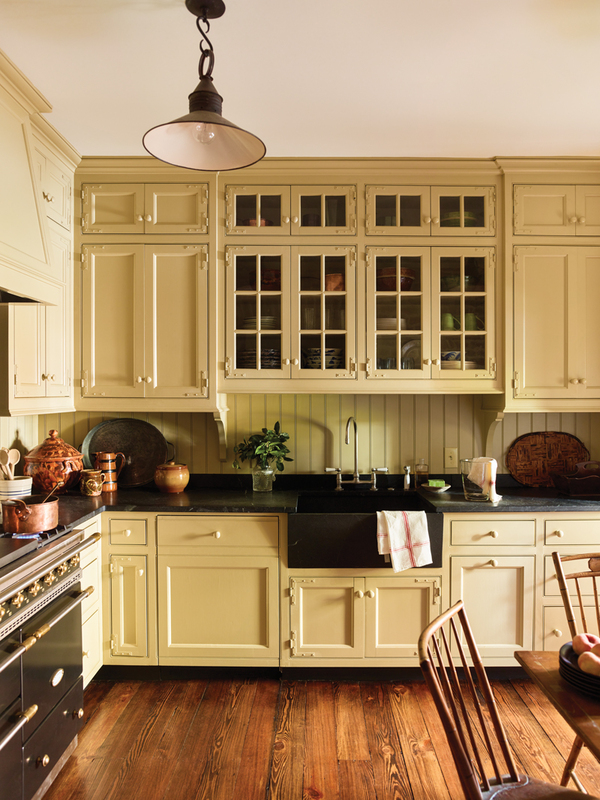 But what’s more, he and his wife Erika Sanchez Goodwillie, a leading expert in the replication of historic paints who has done work at museums nationwide, opened their home to us with a feast of central New York foods such a Utica Greens and Tomato Pie. Christian even curated a pop-up exhibit of Shaker chairs! 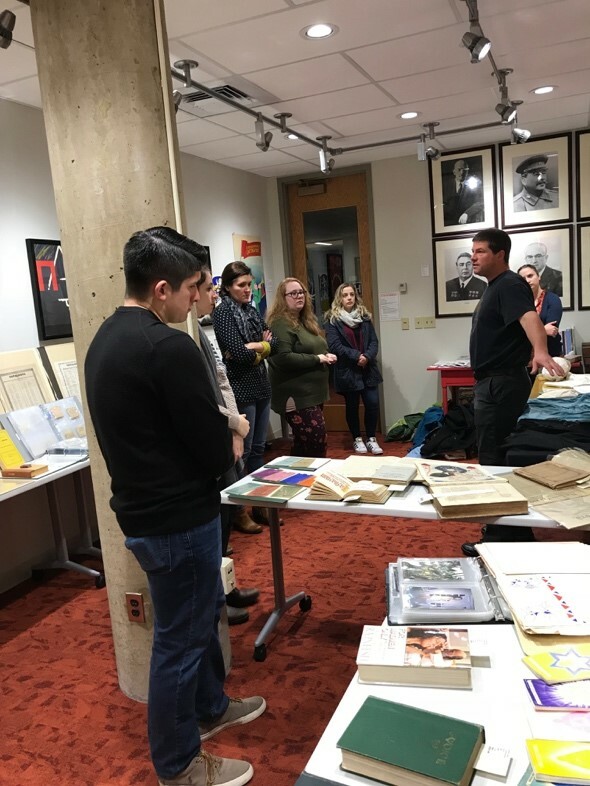 Christian Goodwillie shows the students the riches of Hamilton College’s Communal Societies Collection in the reading room. Winterthur field trips are a total immersion experiences, and as such we stayed the night at the famed Oneida Community Mansion House, the home of the 19th-century Perfectionists led by John Humphrey Noyes, and still a home today to descendants of the original communards. These communards practiced, among other things, “bible communism,” “complex marriage,” and “mutual criticism,” but are better known today as a flatware company. 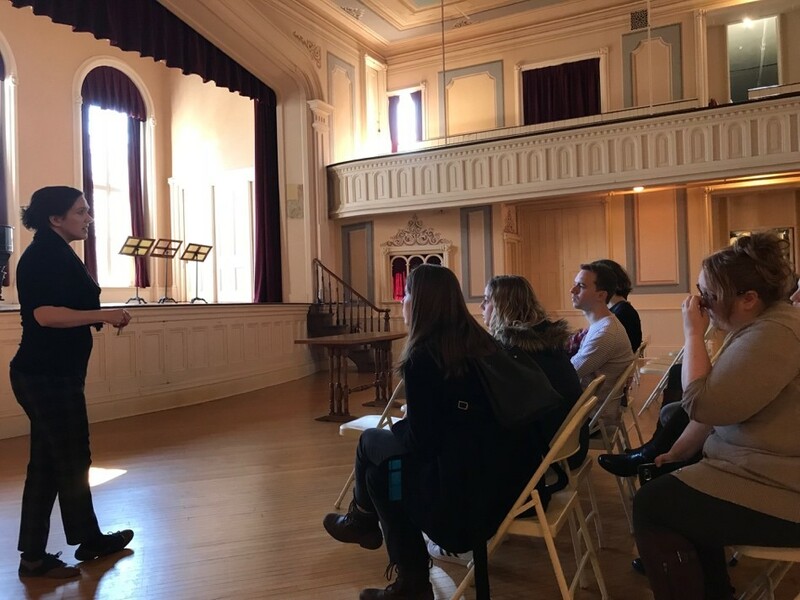 The students woke rested as we embarked on a tour of the Mansion House with Curator of Education Dr. Molly Jessup, who explained how the material culture of the Mansion House, especially the architecture, reinforced and reflected the tenets of Perfectionism. There is little rest on the road to utopia, and the afternoon brought another 19th-century group to the fore. Palmyra, New York, is the site where the Church of Jesus Christ of Latter-day Saints (colloquially known as the Mormons or LDS Church) was founded by Joseph Smith and where the Book of Mormon was first translated. Here, church elders toured the students through the Hill Cumorah Visitor’s Center, the Smith Family Home, and the Whitmer Log Home—all sites held sacred by Mormons. Here we were immersed in the teachings, history, material culture, and current missionary efforts of the LDS church and learned how this area today functions as a pilgrimage place for Mormons worldwide. The class poses in the Peter Whitmer Log Home. This re-created rustic farmhouse was the site where the Church of Jesus Christ of Latter-day Saints was initially organized. Our weary band of travelers rested their bones in Ithaca, New York, a town that in many ways still embodies the counterculture of the 1960s and 70s. 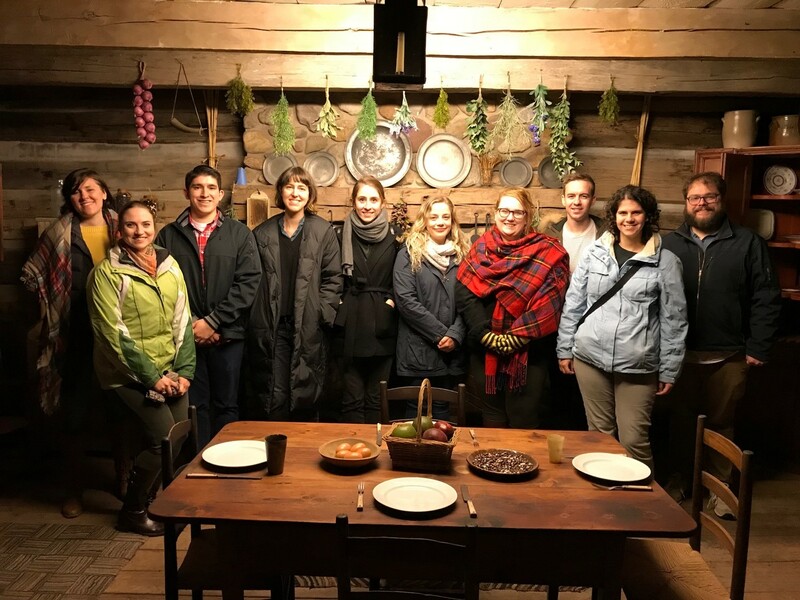 During our last day on the bus, the students visited a present-day intentional community, the EcoVillage at Ithaca, a co-housing ecovillage that is dedicated to showing the world a new way to live that involves green energy, permaculture, and an overall emphasis on sustainability. We toured the village led by Liz Walker, the founder of the community, which has been in existence more than 25 years and now numbers more than 200 residents. We talked about sustainability, net-zero energy construction, and gardens as we went into homes and walked the community paths. 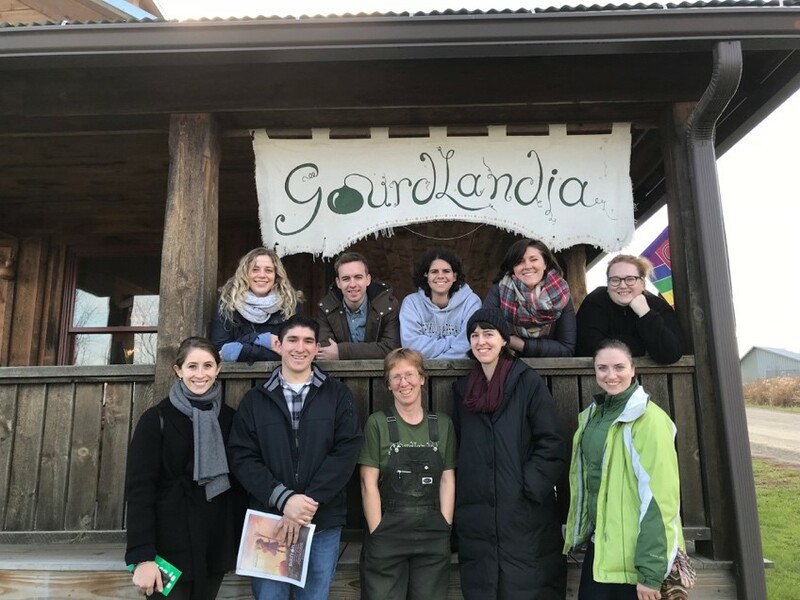 Craft and creativity also thrive at the EcoVillage as we visited Graham Ottoson at “Gourdlandia,” where she shared her passion for creating gourd lamps and specially grown gourds with the group. Sustainably and eco-friendly farming are a staple of the village, and we met with farmer of West Haven Farm, John Bokaer-Smith, who told us all about the Community Supported Agriculture (CSA), the importance of the EcoVillage to community and restaurant life in Ithaca, and practical green problem solving at the farm. The students were even put to work cleaning garlic for the farmer’s market! Inspired by the gourd art of Graham Ottoson, the class posed in front of her shop, aptly named, Gourdlandia! 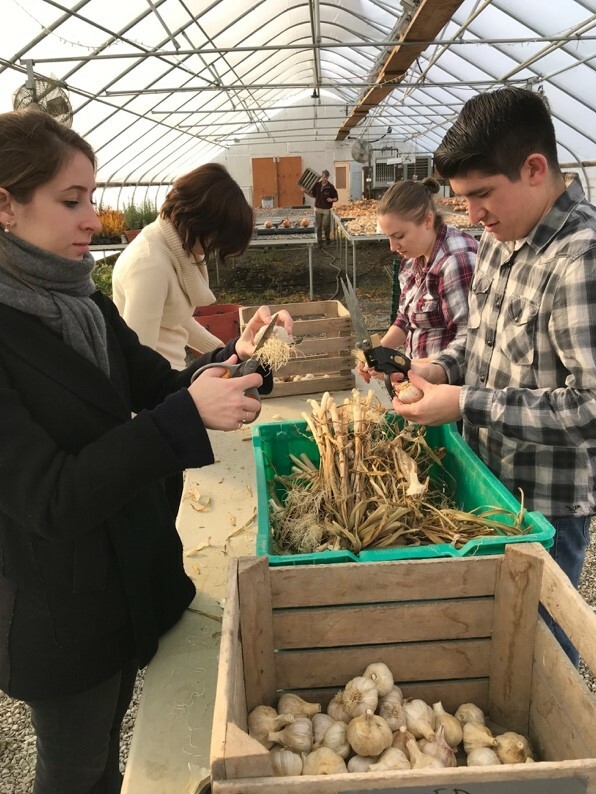 Students got a chance to give back to the EcoVillage at Ithaca by helping John Bokaer-Smith trim the stalks and roots from bulbs of garlic. At the end of the trip, thankfully no one had gotten off the bus. However, I think that Kesey’s sentiment will stay with these students, it surely will with me. No matter where we go, what we are doing, the experiences we had, the people we met, and the things we examined, touched, and felt, will always stay with us. If we do find our way off the bus—if we have forgotten to dream of a different, better world—we will find it again. I am sure. its deep connection to the Northeast and the rest of the Atlantic world. can only be found underground. and embellishing furniture, not just retailing imports. 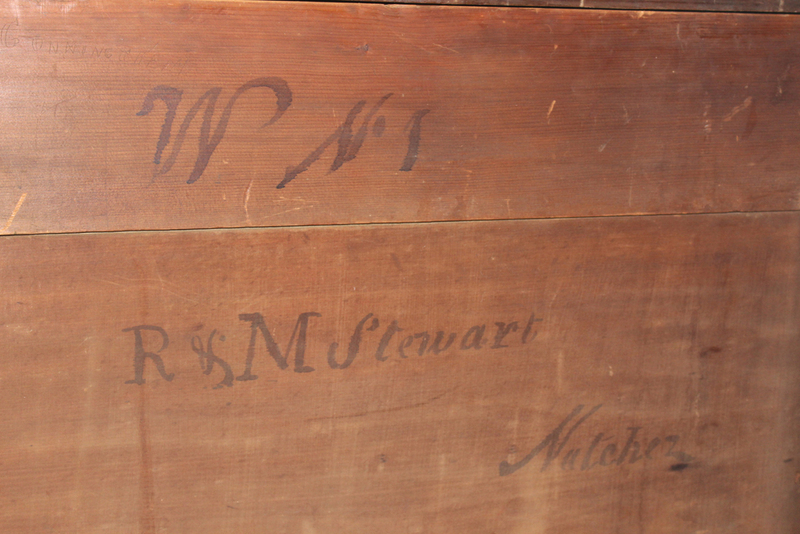 Signature on chest of drawers. myriad hands produced the furniture from his firm. “unboxed” Melrose’s striking, Gothic-revival dining chairs, likely made in Philadelphia. Dining table, possibly Robert Stewart, ca. 1835. York furniture could not meet customer needs. economically with the rest of the country. finally achieved the Southern dream he had furnished for others for decades. 10–12 at the Chase Center on the Riverfront, Wilmington, Delaware. 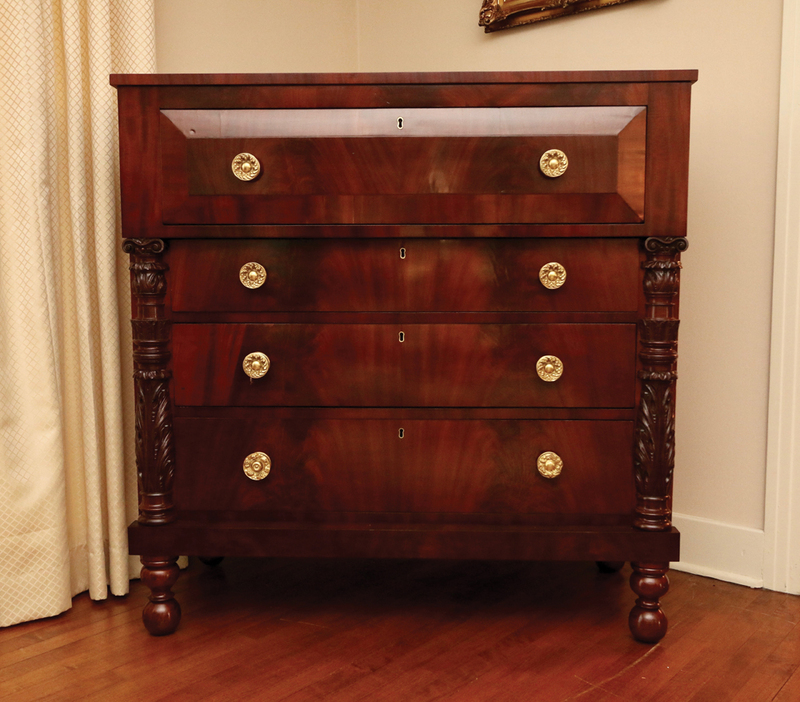 This article originally appeared in the Delaware Antiques Show Catalogue. Foundation, for contributions to Robert Stewart’s biography. 2 “The Cabinet Business,” Catesby Minnis and Robert Stewart ad, Natchez Gazette (Mississippi), January 31, 1818. 3 Cincinnati City Directories, 1829, 1831. 4 R. & M. Stewart ad, Daily Gazette (Cincinnati), February 26, 1835. Robert Stewart’s business operated as well as changes in partnership. Family Account Books, Mss404, 4742, Vol. 37, Hill Memorial Library, Louisiana State University. documented by the Classical Institute of the South in 2013. Account Books, Mss404, 4742, Vol. 37, Hill Memorial Library, Louisiana State University. 9 “Robert H. Stewart, successor to Stewart & Burns,” Natchez Daily Courier (Mississippi), February 9, 1861. Cabinet card of Ariana McElfresh Trail, Gilbert & Bacon, Philadelphia, 1880−90. Quick, as it fell, from the broken staff. after because of their associative qualities. responded with nearly 40 percent more than requested. 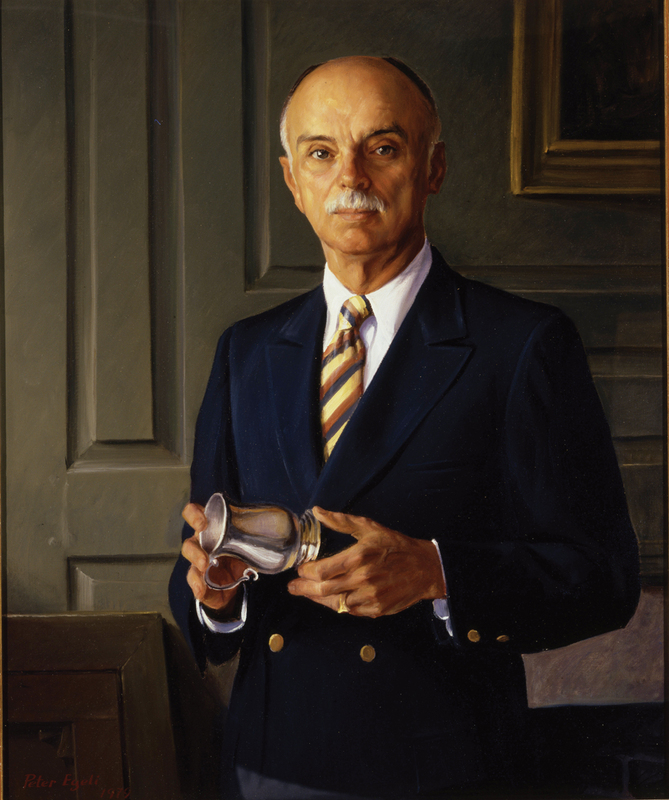 Frederick, but the Bucklers’ social connections were primarily in Baltimore. to encourage him to send money expediently. and why, that one can begin to reveal the complex issues they illuminate. Post by Trent Rhodes, Lois F. McNeil Fellow in the Winterthur Program in American Culture. 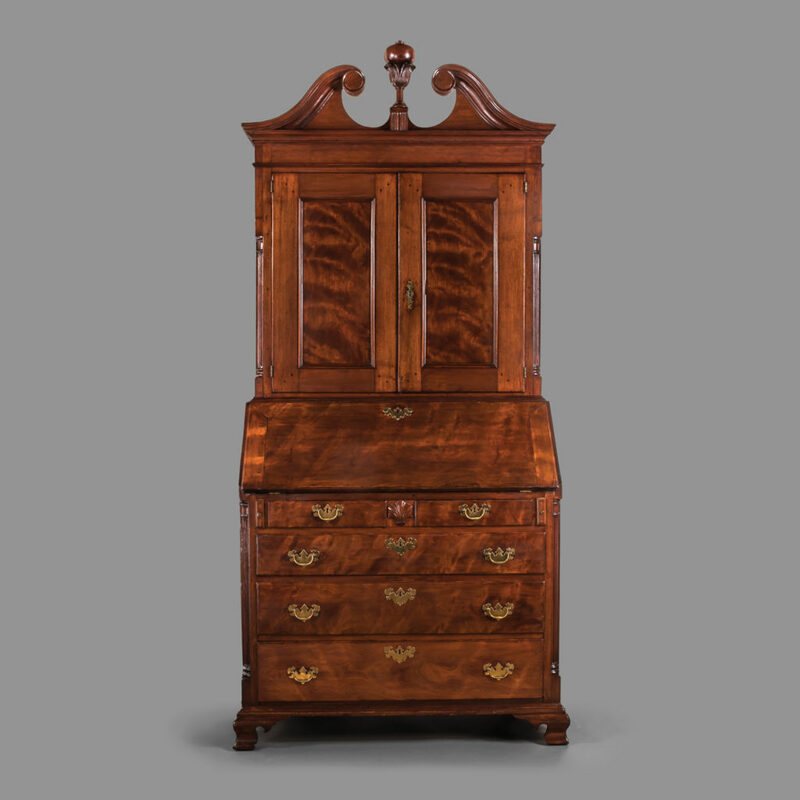 This article originally appeared in the 54th Annual Delaware Antiques Show catalogue and was generously sponsored by Tom Savage. The Delaware Antiques Show takes place November 10–12 at the Chase Center on the Riverfront, Wilmington, DE. 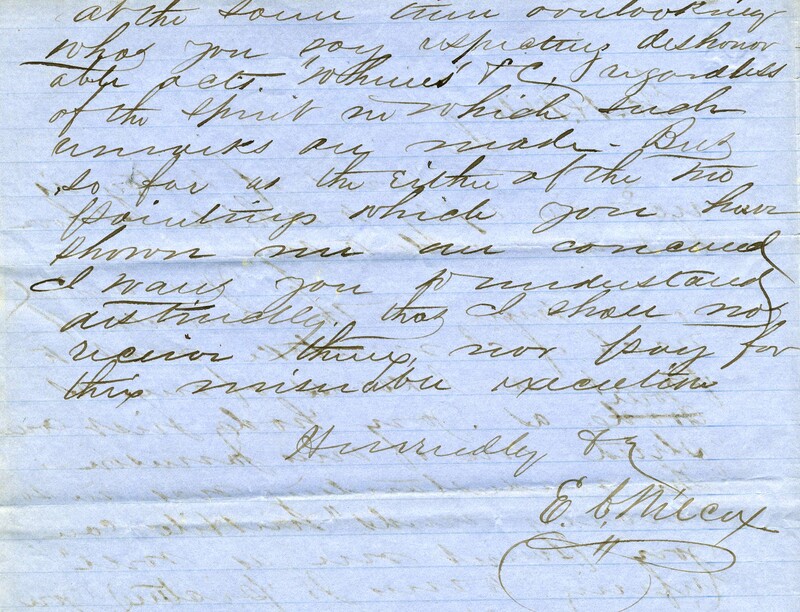 1 Ariana Trail to John Harding, Frederick, Maryland, November 21, 1885, MESDA object file, acc. 3985. 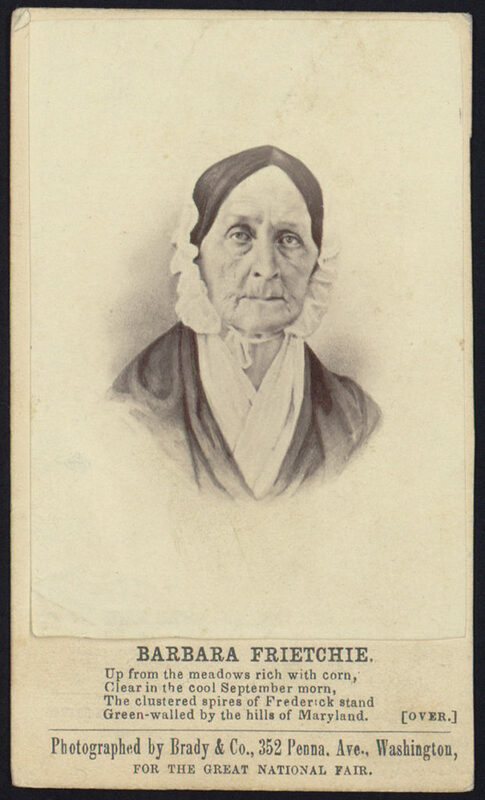 4 The verses here are an excerpt from the poem: John Greenleaf Whittier, “Barbara Frietchie,” Atlantic Monthly 12, no. 72 (1863). 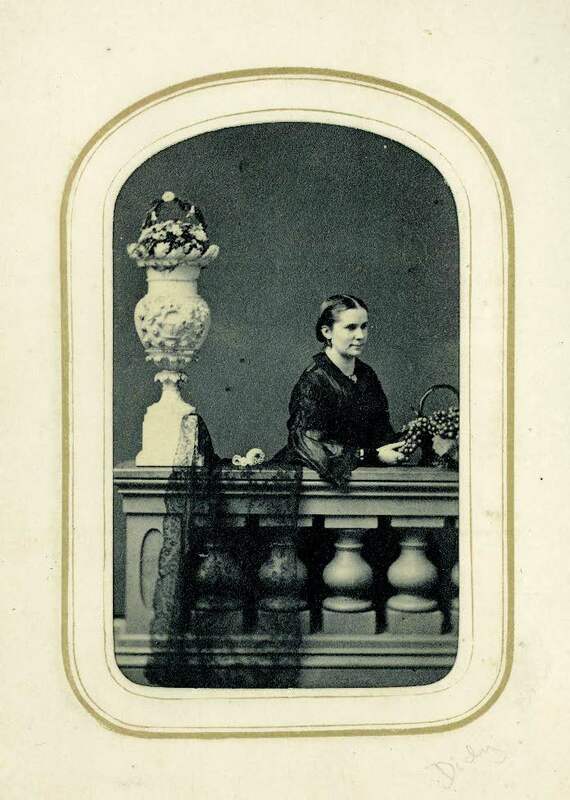 : Frederick, Wills, 1860−1865, vol. 15, image 117 or 173, Hall of Records, Annapolis. 6 Julia Hanna, object history, MESDA object file, acc. 3985. 7 Trail to Harding, November 21, 1885. 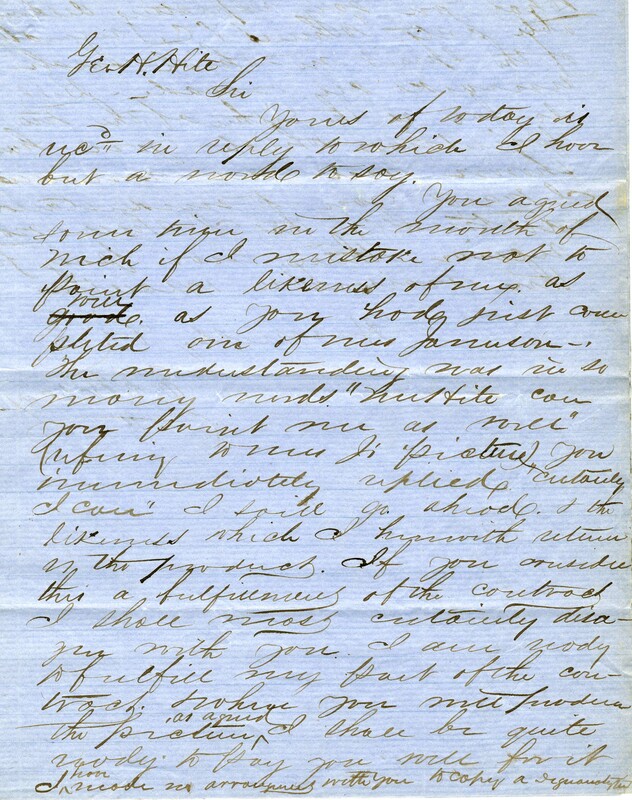 8 John Harding to Ariana Trail, Frederick, Maryland, November 23, 1885, MESDA object file, acc. 3985. 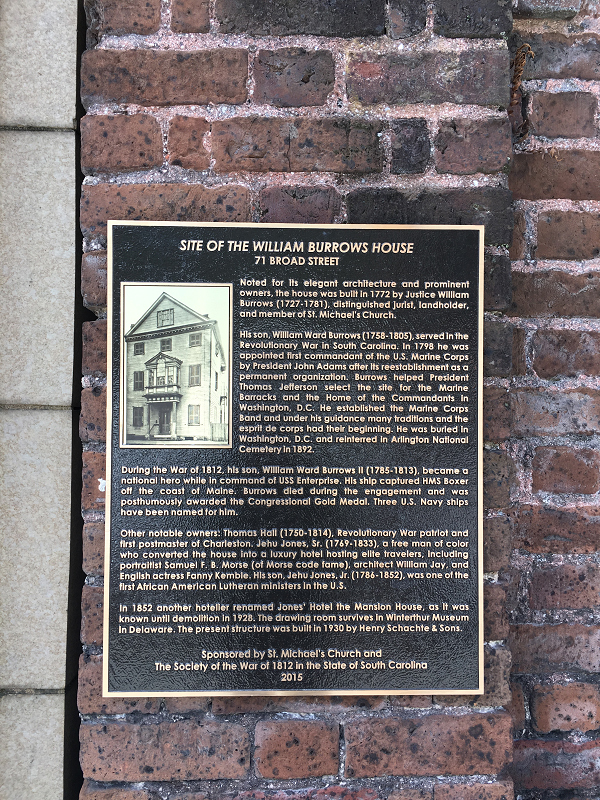 10 Florence Trail, A Memorial of Ariana McElfresh Trail (Boston: R. G. Badger, 1929), 72.
: Frederick, Wills 1849−1854, vol. 1, image 34 of 210, Hall of Records, Annapolis. 12 Pennsylvania Packet (Philadelphia), August 18, 1781. 14 Frank Horton to Julia Hanna, Winston-Salem, N.C., MESDA object file, acc. 3985. Seldom seen by visitors today, the Charleston Dining Room on the third floor of Winterthur contains woodwork and windows from what was once a fashionable gathering place in antebellum South Carolina. 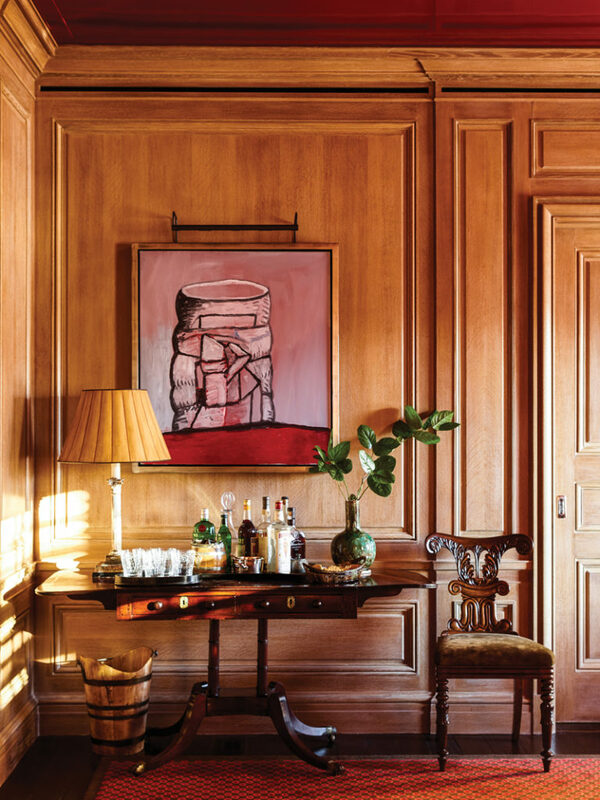 The 18th-century paneling, cornices, fireplace and mantle, and windows come from a hotel that stood in Charleston near the intersection of Broad and Meeting Streets. During its heyday in the 1820s and 1830s, the hotel hosted visitors from across America and Europe. If appreciating the carved woodwork today is easy, grappling with the hotel’s legacy is more difficult. As was common during that time in Charleston, many of the workers who earned the hotel its reputation were enslaved, but what was more unusual was the proprietors were free people of color. Jehu Jones was a tailor who purchased his freedom in 1798 and soon began acquiring real estate—and enslaved human beings too. He purchased the hotel for $13,000 in 1816, but it was probably his wife Abigail, a pastry cook, who put the hotel on the map. 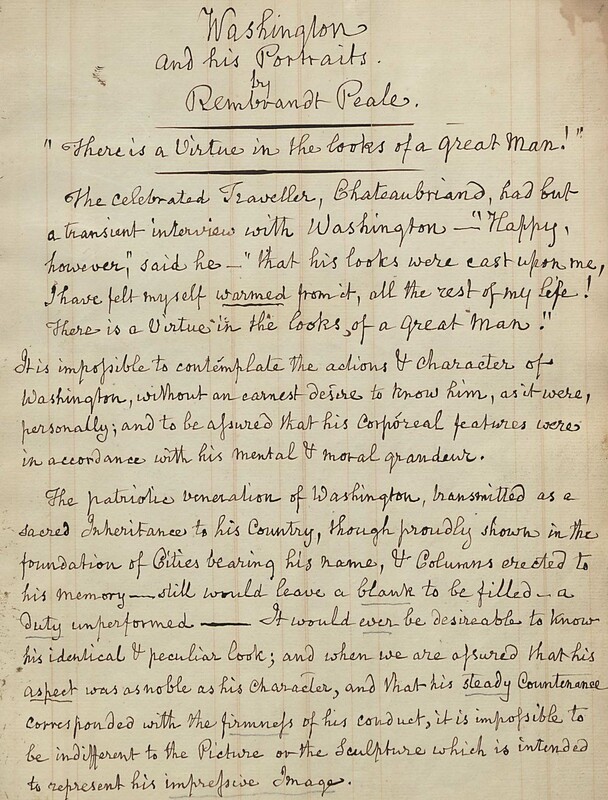 “Every Englishman who visits Charleston,” wrote one foreign guest in 1833, “will, if he be wise, direct his baggage to be conveyed to Jones’s hotel.” The old world elegance of its dinners included iced claret that “might have converted even Diogenes into a gourmet.”(1) Another guest was Samuel F. B. Morse, who was still known as a painter rather than as an inventor. Around 1821, Morse came to Charleston and rented rooms behind the Jones Hotel as a portrait studio. 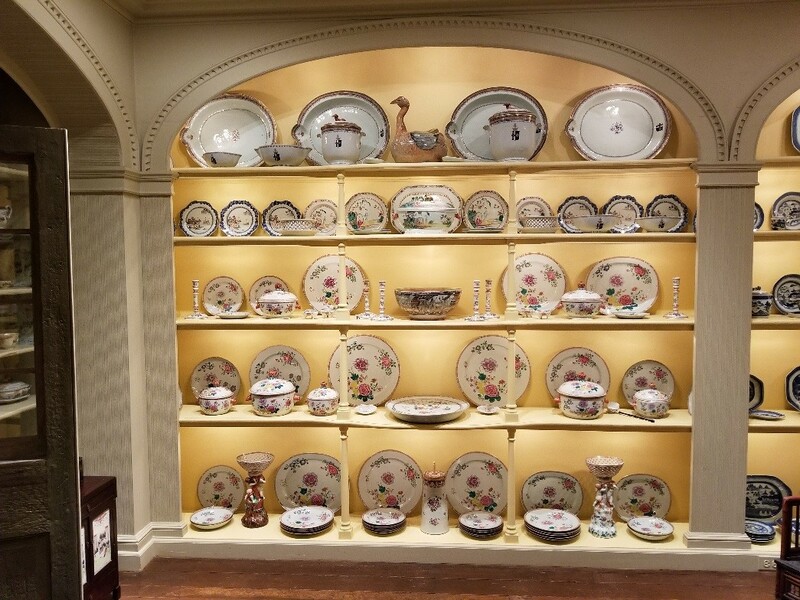 Both guests would have spent time in the Charleston Dining Room. 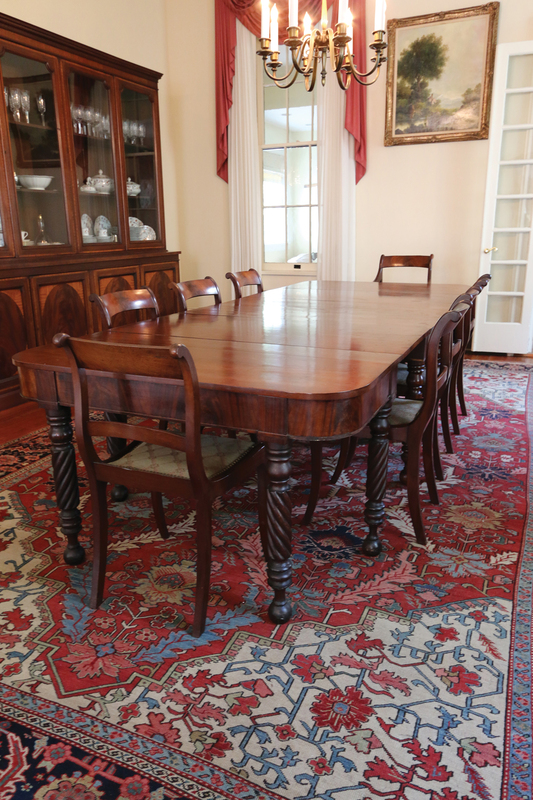 Located on the second floor of the main building, it probably served not as a dining room but as a drawing room, where guests might gather after meals. The bay window projected over the hotel’s main entrance on Broad Street, giving guests a clear view of Charleston’s city hall. The Jones Hotel was also just a few hundred feet from the headquarters of Charleston’s city guard. After nine o’clock at night, the guard would arrest black residents, whether enslaved or free, who ventured out of doors. A German duke staying at the hotel around 1825 recounted hearing a warning call; he was “startled to hear the retreat and reveillé beat there” from inside his room. (2) The Joneses, for all their importance to the social life of the elite—and although they were slaveholders themselves—were among the people being targeted. If you get the chance to see the room today, you are viewing what may be the only identifiable surviving part of the main hotel. The building fell into disrepair in the late 19th century. Around 1928, it was dismantled and placed in storage. 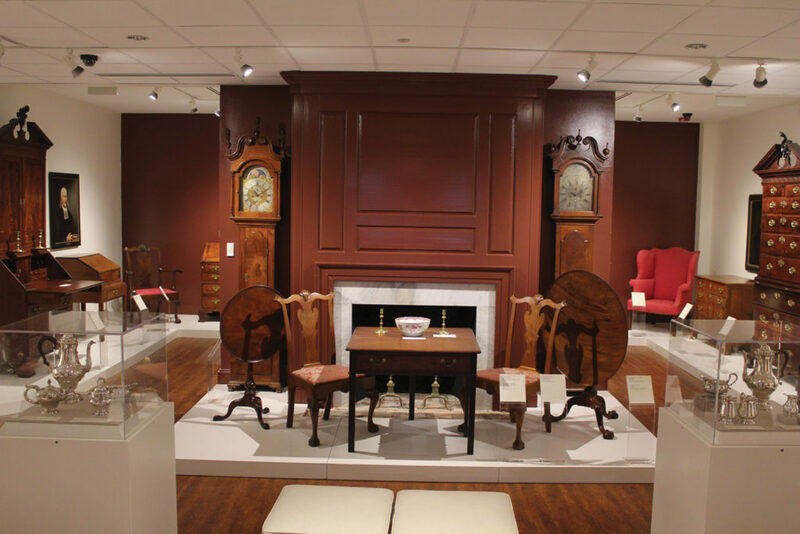 Some pieces, including the paneling from this room, were eventually acquired by the Yale University Art Gallery, where Henry Francis du Pont discovered them in the 1950s. 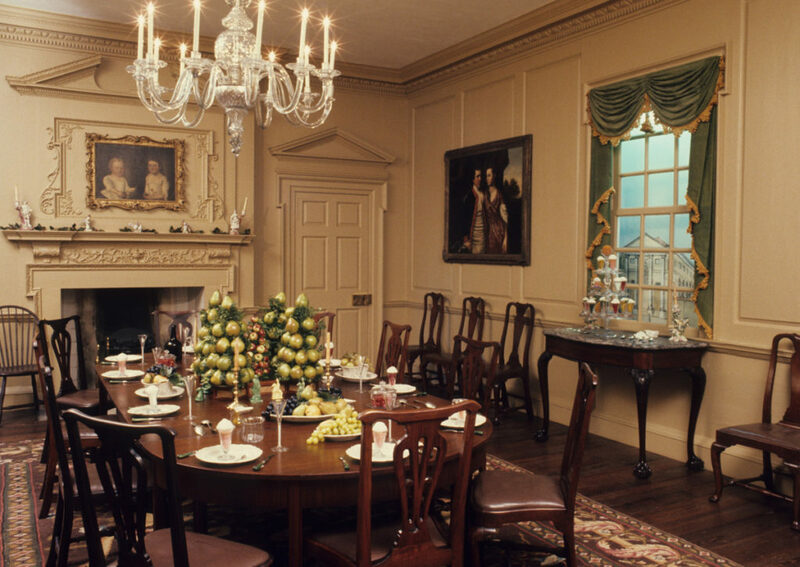 What is now the Charleston Dining Room, was shipped from New Haven and installed at Winterthur, originally to serve as a lunch spot for visitors taking all-day tours. Today, the warm sandy color of the walls is based on the earliest original layer of paint, applied around 1774 when the hotel was constructed as a private home. The white tiles lining the fireplace suggest the patterned Delft tiles popular in Charleston at the time. What comes from the building itself is the carved wood—including the windows, the elaborate decorations above the fireplace, and the two closet doors. The entrance, however, was moved from its original location opposite the bay window in order to fit the current space. Post by Jonathan W. Wilson, a historian and adjunct faculty member at the University of Scranton and Marywood University. He is working on a book project about the Jones family. (1) Thomas Hamilton, Men and Manners in America, vol. 2 (Edinburgh and London: William Blackwood and T. Cadell, 1833), 278. (2) Bernhard of Saxe-Weimar Eisenach, Travels through North America, during the Years 1825 and 1826, vol. 2 (Philadelphia: Carey, Lea & Carey, 1928), 7. Amrita Chakrabarti Myers, Forging Freedom: Black Women and the Pursuit of Liberty in Antebellum Charleston (Chapel Hill: University of North Carolina Press, 2011), 99-100. Harriet P. and Albert Simons, “The William Burrows House of Charleston,” Winterthur Portfolio 3 (1967): 172-203. John A. H. Sweeney, The Treasury House of Early American Rooms (New York: W. W. Norton, 1963), 12 and 76-77. Marina Wikramanayake, A World In Shadow: The Free Black in Antebellum South Carolina (Columbia: University of South Carolina Press, 1973), 79 and 103-111.
truly successful only when the people who live there consider it home. 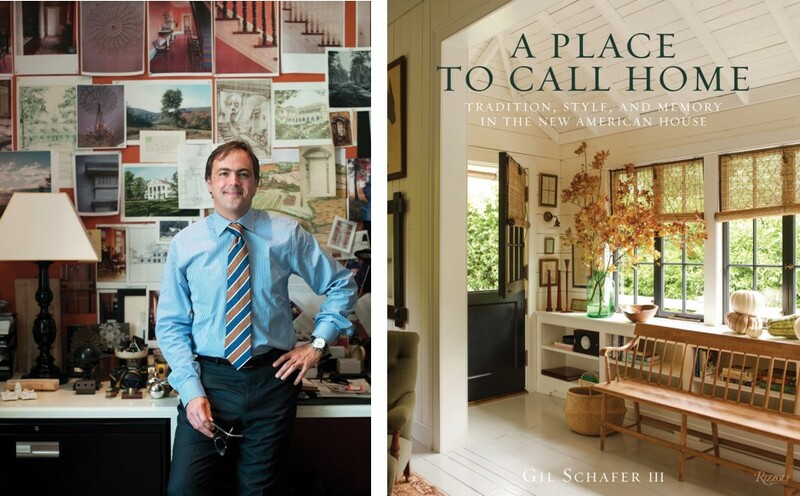 invite readers into Schafer’s world of comfortable classicism. architectural styles within contemporary ways of living. 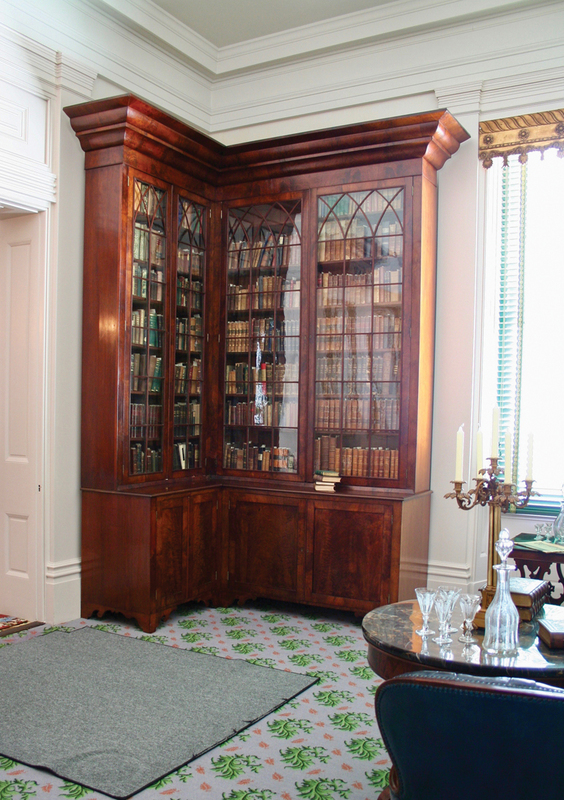 windows to fireplaces, mouldings, and hardware—are informative and enlightening. 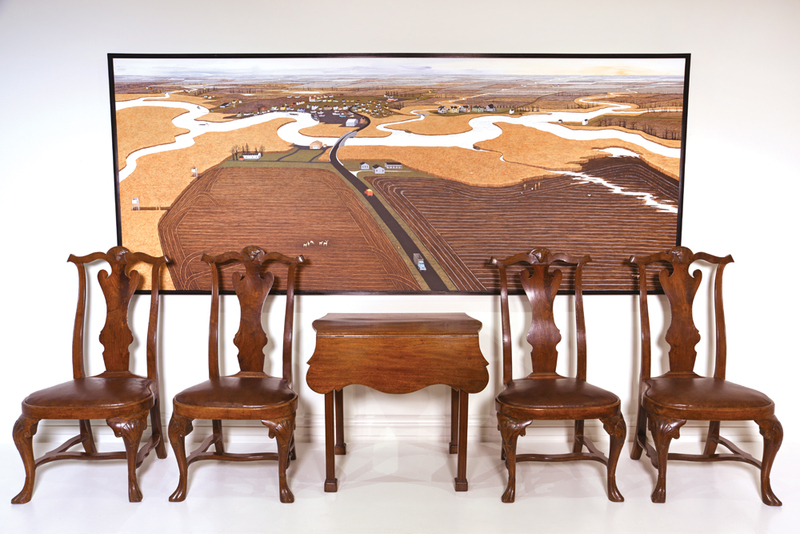 gestures, and ultimately, it’s this combination that brings his homes to life. and fascinating historical background and contextual influences of the settings. rooms, absorbing every detail and every anecdote. Antiques Show or to purchase tickets, please visit winterthur.org/das.